In many ways, Max Hunter's life seems typical for someone who has worked in secondary and higher education for nearly a decade. As the John Perkins Center teaching fellow at Seattle Pacific University, he teaches classes, leads book group discussions, writes scholarly articles, and mentors students. He lives in Seattle's Queen Anne neighborhood with his wife, Risako, and their three children. But in 1988, his story looked a little different. He had spent the previous three years trafficking drugs and was addicted to cocaine. A new Christian, he moved to Seattle in order to leave the drug culture behind. But Hunter doesn't want to leave that part of his story behind anymore. The kid from the projects of San Diego who heard gunshots from his bedroom window is the same person who today is Harvard-educated, with a Ph.D. from the University of Washington and bookshelves that hold volumes on bioethics and critical theory. He now wants to connect the different parts of his story, he says, because they help him bring together the different parts of his city. In his earliest years, trips with his mother and grandmother to San Diego's downtown and La Jolla beaches gave Hunter a glimpse into parts of the city beyond the projects. His grandmother was particularly determined that her kids and grandkids would see more opportunities in childhood than she had. Raised in northern Texas, she had to leave school for work in the cotton fields by age 10, and she remained functionally illiterate. She left for California in search of a better life, and in San Diego she worked as a janitor during the week and cleaned houses on the weekends. Always, she kept copies of leather­bound classics such as Shakespeare's works, books she deeply valued but couldn't fully comprehend. “I was amazed that through her years of domestic labor, she held on to the dream of a better life for herself and her children,” Hunter says. Though his father was absent, Hunter was lovingly raised by his mother, grandmother, and grandfather. Still, his family couldn't help but be affected by the violence happening around them. He remembers witnessing incidents of domestic violence at age 5. He saw drug sales, gunfights, and police brutality. When he was 18, Hunter still managed to make his way to San Diego State University. Money was tight, and never more so than when his mother told him he would need to support himself during his sophomore year. He took a few jobs to make ends meet, including one at a juvenile hall. “I had to check in and lock up youth that I had once sold ice cream to, kids whom I had watched grow up,” he remembers. The violence and harsh punishment that he witnessed seemed only to duplicate the violent actions that put the kids there in the first place. At the same time, his university studies acquainted him with disturbing facts, such as the high rates of incarceration and short life expectancy faced by many African-American men. He began to question whether the American dream his grandmother believed in was for him. “I wanted both a family and a community, and I didn't know how to get either,” he says. A neighbor had made him an offer to get him into “the game” of dealing drugs. He resisted at first, but eventually he called the neighbor. In Hunter's first week of dealing, he made more money selling 4 ounces of crystal meth than he had earned in the past three months. If there's any misconception that Hunter wants to correct about people who deal drugs, it's that they're “brainless.” For instance, his college chemistry knowledge came in handy when “freebasing,” turning powder cocaine into smokable crack cocaine. And he can list off former dealers he knows who are now college-educated, legally employed, and sending their own kids to college. One put his wife through graduate school with drug money. For a time, Hunter believed he could live that double life, using his drug money to launch himself out of the ghetto and into the middle class. But he says he felt spiritually convicted about what he was doing. He started to drink more alcohol and snort cocaine to dull the guilt. He became a supplier, distancing himself from on­the­ street drug sales. Looking back on this dark time, he sees God's hand in a series of events. Other unlikely pointers to faith surfaced. Curiosity about “Jah,” the Rastafarian name for God in the reggae music he enjoyed, prompted him to begin reading the Bible on his own. At the same time, his grandmother's powerful faith continued to be a witness in his life. On June 24, 1988, he finally committed his life to Christ. Two days later, he drove his car to the airport and flew from California to Washington, intending to move to a state he'd never visited before. Despite this dramatic step toward change, he says, “I had lived such a broken life, it took a long time to get healed.” Drug and alcohol rehab would also play a role in his recovery, along with therapy. “It took a long time for my head to catch up with what happened in my spirit,” he adds. Hunter is ambivalent about this label. “I was always learning no matter whether I was on the streets or in the schoolhouse,” he points out. Since then, he’s continued learning: Curiosity about the relationship between race and medicine led him to seek a master’s degree in the history of science and a certificate in bioethics at Harvard, where he also earned a master’s degree in education. He now serves as a mentor for some students in the Minority Association of Pre­Health Students at SPU. He has taught courses at Seattle Pacific, including “Issues and Values” in the Biology Department, and “Diversity in the Classroom” in the School of Education. 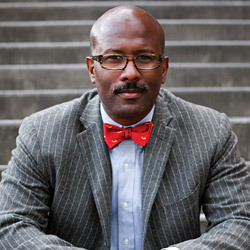 He also continues his studies, working on a doctorate in educational leadership at the University of Washington. On top of those activities, Hunter plans to write an autobiography, which he sees as a story of reconciliation and hope, despite its darker moments. “Healing occurs when we embrace our strengths and weakness,” he says. For a time, he resisted talking about his involvement with drugs, because he was worried that he would perpetuate negative stereotypes of African-Americans. But, he came to believe, identifying with marginalized people through his personal story was critical to his faith. The gospel passages about Jesus eating with tax collectors and being crucified between two thieves resonate for Hunter. “Jesus was identifying himself with that population. He’s not waiting for the prisoner to get saved and get his life together,” he says. For instance, he works on a committee at the Seattle Art Museum, looking for opportunities to broaden the audience for art in Seattle. “I’m interested in connecting downtown cultural institutions with communities that are being underserved,” he says. This goal fits naturally with the mission of SPU’s John Perkins Center to build bridges between Seattle Pacific and the city of Seattle, and to educate students about reconciliation while helping them actively engage with all their urban neighbors. To learn more about SPU's John Perkins Center for Reconciliation, Leadership Training, and Community Development, visit spu.edu/perkins.